Super buttery, chewy and irresistibly easy. 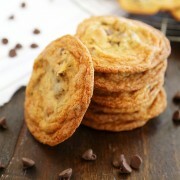 Bake up this recipe of my best-ever batch of thin, deliciously dunkable chocolate chip cookies today. If you like them thicker (and even softer), check out this recipe! When it comes to chocolate chip cookies, I respect that everyone has their own religion. I pray at the alter of thick, soft and gooey cookies, with a glass of milk to wash one (or three) down. Or, better yet, a hot cup of coffee to dunk into. However, I know not all worship my way. I’ve been asked by readers repeatedly for a thin and buttery, bakery style cookie with crispy edges. And, even though I will probably be in a bikini for most of this coming weekend, I willingly obliged and broke out my mixing bowl and stretchy pants for some recipe testing. And tasting. And testing. And more tasting. I gained five pounds. But, I found it! 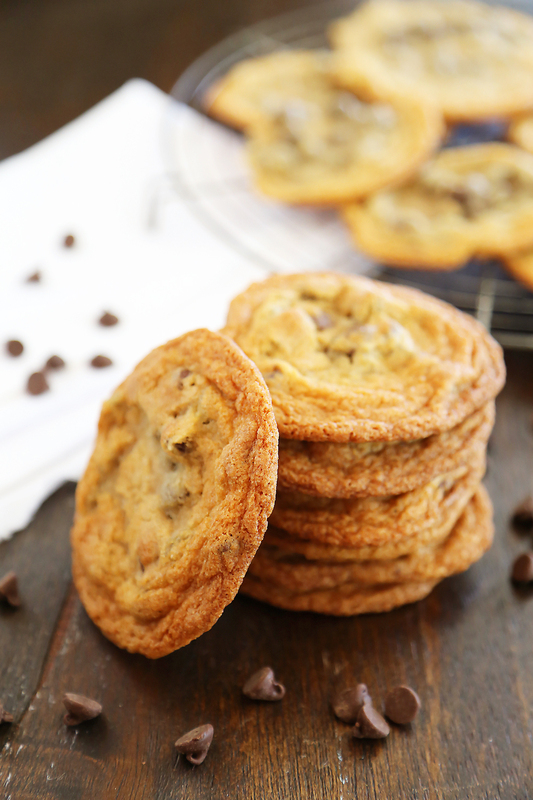 The perfect flat, chewy chocolate chip cookie. My grandma used to keep cookies that tasted JUST like these in her freezer. As a kid, I never understood why. As a cookie monster adult, it has all become clear. And now I crave them cold. 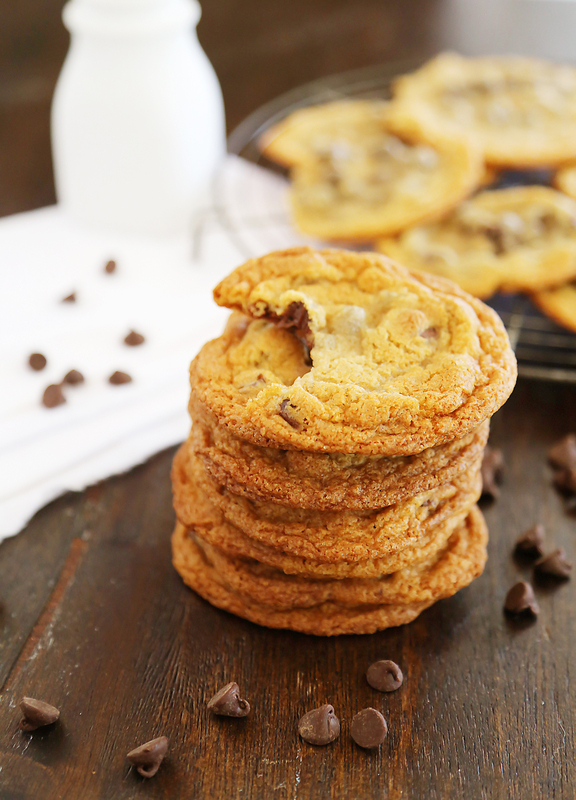 These chocolate chip cookies are unbelievably good. Buttery soft, with a slight chew and a strong vanilla aroma. The texture melts in your mouth. And suddenly, you’ve eaten a half dozen. I have to say, they’re almost good enough to convert me from my thick-cookie-lovin’ ways! Bake a batch and share them with friends this week. Or, go grandma style and freeze a bag for when the craving strikes. They’re amazing crumbled over ice cream! Preheat oven to 350 degrees F. Line a large baking sheet with parchment paper; set aside. In a separate large bowl, or the bowl of your stand mixer fitted with the paddle attachment, beat butter and sugars until light and fluffy. Add eggs and vanilla extract. Add flour mixture, mixing until completely combined. Do not over-mix. Fold in chocolate chips. Remove from oven and let cookies rest on baking sheet for 5 minutes. Transfer to a wire rack to cool completely. 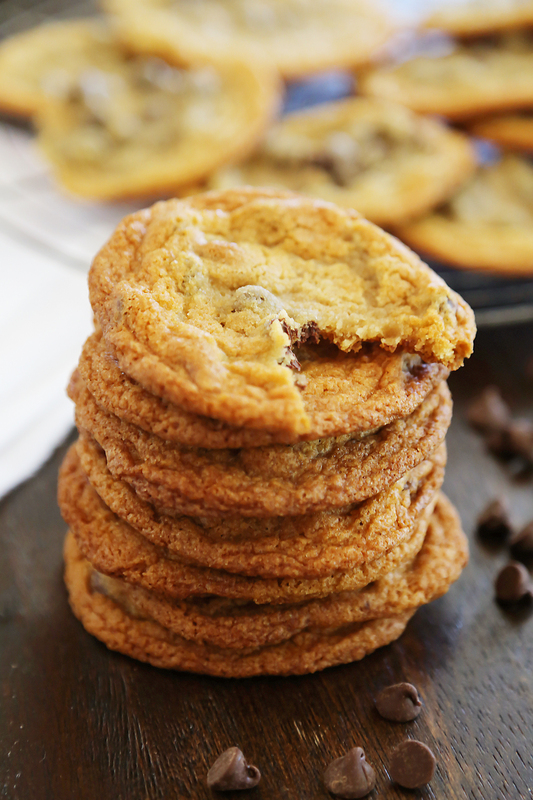 I also am a believer in thick and chewy BUT thin cookies have their place too and they can also be so delicious. Love the recipe! Chocolate chip cookies are my fav!! Hi. With equal amounts of white and brown sugar and nothing special about this recipe, what makes them thin and crispy? Do they always turn out this way for you? The pictures look amazing. I am in the middle of making these cookies. I just sampled the first one, & they are just as you described, & I love them! I added a little more chocolate chips & some chopped walnuts for my own personal taste, but this is my go to recipe from now on! Thank you!!!! So, we have a chocolate chip cookie throw down at a family reunion this week and i know the way to my dad’s heart is thin, thin, thin. I’ve been testing these for the past 2 days and they seam to spread waaay too much. What are your thoughts? I’ve done everything from chill the dough, to lower the baking temperature to switch from dark pans to the shiny silver ones and they are still spreading out too much and don’t look like your picture. The taste is awesome, but the pretty factor is no bueno. I would just say make sure you are following the ingredients and directions exactly, and not scooping your cookie dough balls too large. These look wonderful! 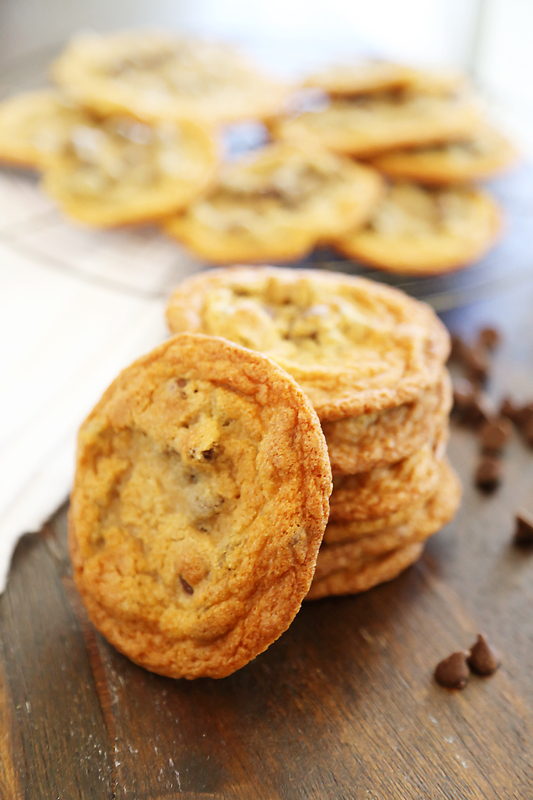 Could you share how much dough you use per cookie & how far apart on the sheet you place them? Per cookie, I scoop about 1/2 Tablespoon of dough and space about 1 inch apart on the cookie sheet (about 9 per sheet). Made these tonight. I got perfectly crisp edges and chewy centers. I used a whole bag of chocolate chips (which distributed nicely – I don’t think 1 cup would’ve been enough) and put the dough in the fridge in between batches. Great recipe! Thank you thank you thank you! Just made them and they are perfect!!!! I’ve only been looking for this recipe for a solid year! These looked like the kind I’ve been looking for, but these were too crispy & hardly chewy (except when fresh from the oven), and they tasted odd. I followed this recipe exactly, I didn’t overcook them, took them out when starting to turn color at the edges and left them on the pan for five minutes, and then tried three minutes for another batch, and within 20 minutes of taking them off, they turned almost rock hard. Very crispy. Also, the taste was off – very eggy. The taste of the cookie reminded me of a slice of buttered toast with an egg and chocolate on top. I mean, it tastes fine, but the egg is too overpowering and they’re far too crispy to be considered a HG chocolate chip cookie, much less one I’d remake. Sorry. So I tried I pulled these out of the oven and let them rest, but as I was trying to take the cookies off to put them on the cooling rack they completely fell apart. Any tips? Without more details, I can’t predict what might have gone wrong. But, the just-baked cookies should rest on the baking sheet for a few minutes before transferring them to your cooling rack. Thanks for sharing this awesome recipe! I just baked a batch of these and they turned out thin and chewy which was exactly what I wanted. Whenever I follow a recipe online they never turn out like I want them to but….. Just made these, turn out exactly as she said, best cookies I have ever made!!! This was so good!!! I brang it to a party and it was the star of the show! People loved how it was chewy yet crisp. It had the perfect amount of sweetness and it gives just a tiny kick of salt. But because of the butter it tasted a lot like the snickerdoodles recipe I use. Still a great choice for you and your family. A quick snack on the go or just a delightful quilts pleasure I encourage everyone to make this recipe. Did anyone lower the amount of sugar that they put in? If so, did they turn out as shown about? And how much sugar did you put in? 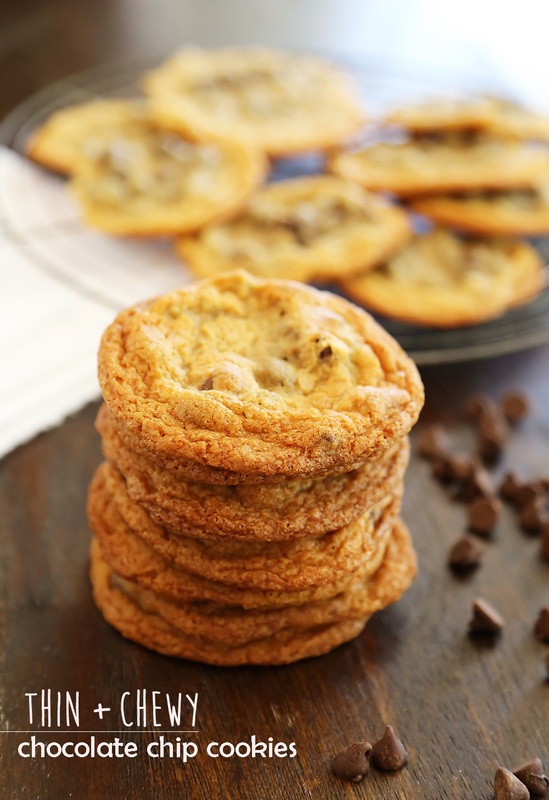 Have been on the hunt for thin crispy cookies that are still chewy and whipped this recipe. So delicious! I cracked a little salt on top when they came out of the oven too. Been on the hunt for a really amazing chocolate chip cookie and these are it. Thank you so much! They are perfect. Simply want to say your article is as astonishing. The clearness for your submit is just cool and that i can suppose you are knowledgeable on this subject. Well along with your permission allow me to seize your RSS feed to keep up to date with approaching post. Thanks one million and please keep up the gratifying work.